Investing in mid cap mutual funds are known as “sweet spot” investment. Investor can participate in companies business with market cap between $2 billion and $10 billion. 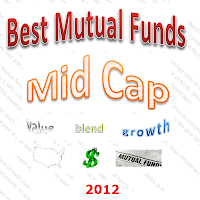 Some of the best mid cap stock mutual funds are: Scout Mid Cap, Brown Capital Management Mid-Cap, ING Mid Cap Opportunities, etc. As part of stock mutual fund, domestic stock fund has three main categories such as large cap fund, mid cap fund, and small cap fund. Each category invests in different type of companies. 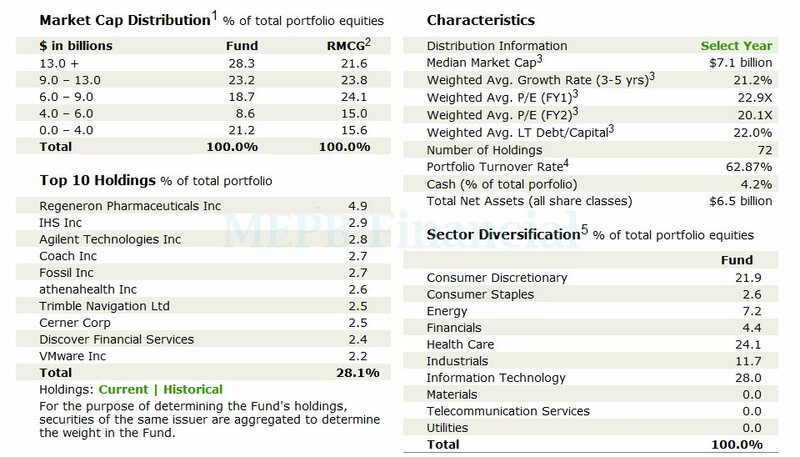 For example, mid cap stock fund invest mainly in medium sized companies. These medium sized companies mean the companies have a market capitalization between $2 billion and $10 billion. Depending upon the fund’s objective, some mutual funds may invest in other companies’ sizes. The reasons to invest in these mid cap stock mutual funds are: these equity funds have higher growth potential than large cap mutual funds, less coverage from analysts which can provide a surprise upside, and less risky than small cap mutual funds. These stock mutual funds are selected based on its long term performance. You will find other fund review such as fund profile, performance, management team, top holdings or top stocks, expense ratio, sales load, top sectors, net assets, fund objective, etc. You will find most of these funds to be mid cap growth, and some mid cap blend, there is none mid cap value in this list. 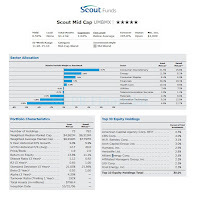 The investment objective of Scout Mid Cap fund is to provide long-term capital growth. 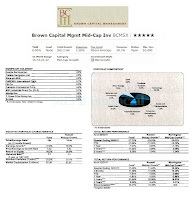 This equity fund utilizes its assets to purchase mid-cap equity securities. These mid-cap companies have market capitalizations between $1.5 billion and $17 billion. It may invest some part of the portfolio (<20%) in foreign companies, American Depositary Receipts (ADRs), and Global Depositary Receipts (GDRs). Patrick Dunkerley has been the lead fund manager since October 31, 2006. This mid cap blend mutual fund has total net assets of $1.18 billion. Its expense ratio is 1.04%. There is no sales load. The dividend yield is only 0.59%. Morningstar rated it with the highest rating (i.e. 5-stars). Since its inception, the only year the fund recorded negative return was in 2008 with -35.10%. The YTD return of this fund is 14.62%. The top 10 equity holdings of this mid cap stock fund as of December 2011 are American Capital Agency Corp REIT (4.3%), CBS Corp. (4.0%), W.R. Berkley Corp (3.1%), Arch Capital Group Ltd (3.0%), Humana, Inc (2.9%), Herbalife Ltd. (2.8%), Alliant Energy Corp. (2.6%), Affiliated Managers Group, Inc. (2.5%), UGI Corp. (2.5%) and Xcel Energy, Inc. (2.3%). These top holdings represent 30.0% of the total net assets. 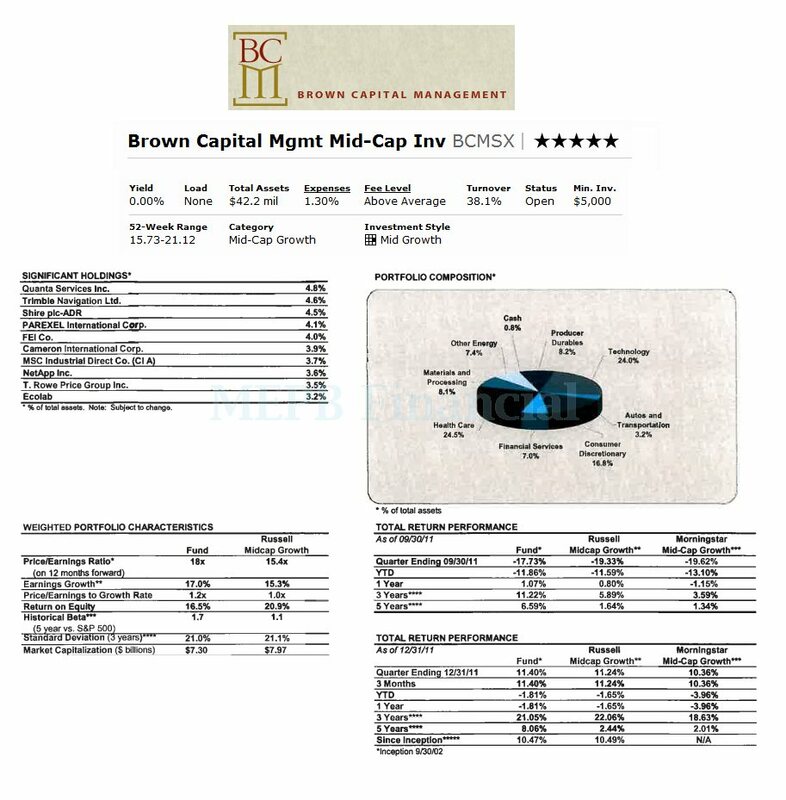 Also rated with 5 stars rating, this Brown Capital Management Mid-Cap fund mainly invests its assets in a portfolio of equity securities of companies whose market capitalizations are considered as mid cap companies. It usually invests in common stocks, but may invest in preferred stocks, convertible bonds, and warrants. It will use Russell Midcap Growth Index as its guideline. Morningstar has ranked this top performer domestic stock fund with 5 stars rating. This Mid-Cap Growth fund has annual expense ratio of 1.30%. The management fee of this fund is 0.25%. The lead manager of this no load fund is Daman H. Blakeney. The minimum initial investment of this fund is $5,000 for brokerage account. There are 32 brokerages that provide the sale of this fund. The top 10 stocks in its holdings are Quanta Services Inc (4.8%), Trimble Navigation Ltd (4.6%), Shire plc-ADR (4.5%), PAREXEL International Corp (4.1%), FEI Co. (4.0%), Cameron International Corp (3.9%), MSC Industrial Direct Co. (3.9%), NetApp Inc (3.6%), T. Rowe Price Group Inc (3.5%) and Ecolab (3.2%). The Integrity Williston Basin/Mid-North America Stock fund objective is to achieve long-term capital appreciation. This fund invests majority of net assets in the stock of domestic and foreign issuers that are taking part or benefiting from the development of the resources in the Williston Basin area and/or Mid-North America area. It may invest in development stage companies. This mid cap mutual fund has annual expense ratio of 1.42%. The average ratio in the category is 1.37%. Its dividend yield is 0.00%. The most recent dividend was distributed in 2009 in the amount of $0.01. Since February 2010, this equity fund has been managed by Monte L. Avery. It is available for purchase through 62 brokerages. This mid cap fund has achieved 7 years of positive return and 5 years of negative return since its inception. Based on the load adjusted returns, the fund has returned -14.00% over the past 1-year and 6.70% over the past 10-year. The fund has 4.06% YTD return. The top 5 stocks in its assets are Kodiak Oil & Gas Corporation, National Oilwell Varco Inc, Oasis Petroleum Inc, Hess Corp and Carbo Ceramics Inc. This Rydex S&P MidCap 400 Pure Growth uses its net assets to purchase securities of companies in the underlying index. It may use derivatives and other instruments to achieve its objective. This mid cap stock mutual fund is offered under the Guggenheim Investments fund family. The YTD return is 13.80%. The fund’s expense ratio is 1.54%, a bit higher compared to the average in the category (1.37%). This fund applies 0.25% management fee and 4.75% maximum sales charge. It is currently managed by Ryan A. Harder. Morningstar ranks this domestic stock fund with 4-stars rating. It has its best 1-year total return in 2009 with 55.94%. The fund has returned 32.19% over the past 3-year and 8.13% over the past 5-year. The fund has total net assets of $364.90 million. 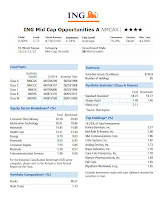 The ING Mid Cap Opportunities fund objective is to seek long-term capital appreciation. 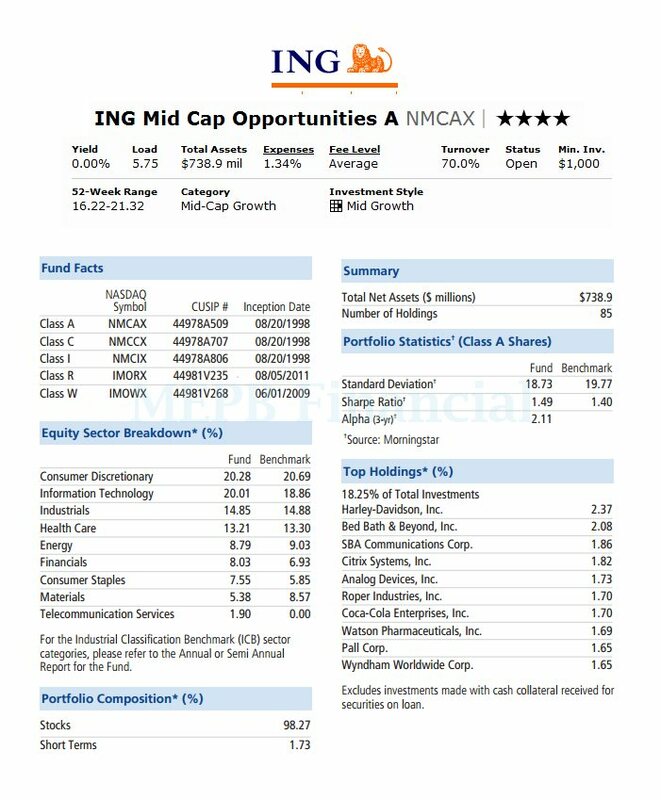 This ING fund generally invests >80% of net assets in the common stocks of mid-sized US companies with market capitalizations similar to companies in the Russell Midcap Growth Index. Jeff Bianchi and James A. Hasso are the current lead fund managers. The fund CUSIP is 44978A509. Its dividend is distributed annually. This ING Mid-Cap Opportunities fund can be purchased through 103 brokerages, like JP Morgan, Vanguard, Merrill Lynch, Scottrade Load, Edward Jones, Td Ameritrade Inc, E Trade Financial, Morgan Stanley Advisors, etc. The other classes of this mid cap mutual fund are Class C (NMCCX), Class Institutional (NMCIX), Class R (IMORX) and Class W (IMOWX). The top 5 holdings of this equity fund out of the total 85 holdings are Harley-Davidson Inc (2.37%), Bed Bath & Beyond Inc (2.08%), SBA Communications Corp (1.86%), Citrix Systems Inc (1.82%) and Analog Devices Inc (1.73%). The Eaton Vance Atlanta Capital SMID-Cap fund is seeking to achieve long-term capital growth. It invests its assets in common stocks of companies with small to mid-sized market capitalizations. This domestic stock fund uses Russell 2500 Index as its benchmark. With total net assets of $2.34 billion, this Eaton Vance mutual fund is ranked with 4-stars by Morningstar. Investors can buy this stock fund with a minimum initial investment of $1.000 for brokerage account. The annual holdings turnover as of April 13, 2912 is 19%. The YTD return is 10.60%. The top 5 stocks as of March 2012 are Markel Corp (4.73%), Morningstar Inc (3.56%), Affiliated Managers (3.46%), LKQ Corp (3.44%) and HCC Insurance Holdings Inc (3.21%). The management team of this fund consists of Charles B. Reed, W. Matthew Hereford and William O. Bell. Rated with 5 stars, this Artisan Mid Cap fund invests mainly in medium sized companies stocks. It also has total net assets of $6.5 billion. The expense ratio is 1.24%. There is no sales load. This stock mutual fund is limited to new investors. It is also rated with silver rating by Morningstar analyst. The top 3 holdings are Regeneron Pharmaceuticals Inc, HIS Inc, and Agilent Technololgies Inc. The fund has returned 26.55% over the past 3 year, 7.22% over the past 5 year, and 8.39% over the past decade. 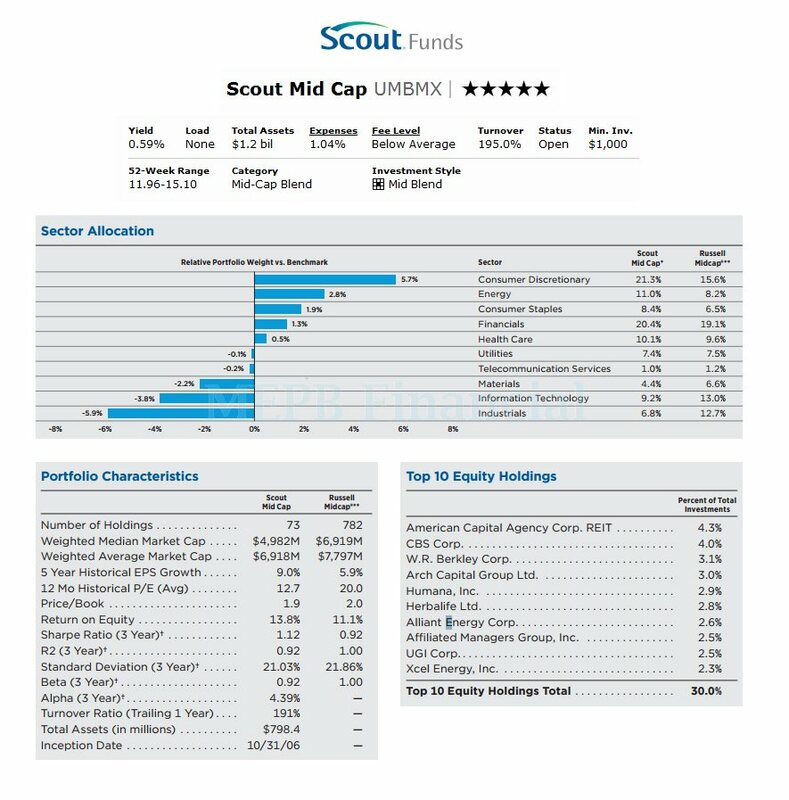 This Delaware Smid Cap Growth fund has an expense ratio of 1.32%. The annual holdings turnover rate is 21%. It is also limited to new investors. If it is open to new investors, the minimum initial investment is $1,000. It has a 3 year annualized returns of 30.27%. This best mid cap growth stock fund is ranked with 5 stars rating. The top 3 sectors include Technology, Industrials, and Consumer Defensive. The investment objective of Waddell & Reed New Concepts fund is to provide investment growth by investing in mid cap companies stocks with above growth potential. It currently has $1.62 billion assets. The yield is 0%. Morningstar has rated this fund with 4 stars rating. Kimberly A. Scott is the fund manager. 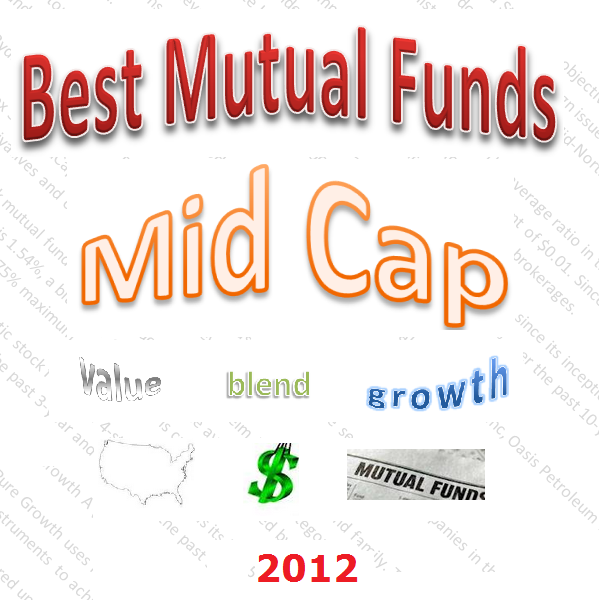 Delaware Select Growth fund is another 4 stars mutual fund. It has consistently ranked above average within its mid cap growth category. This class A fund does has a sales load of 5.75%. The expense ratio fee is 1.515 per year. The currently net assets are $735 million. This mid cap stock fund has a team of advisors in its management team.